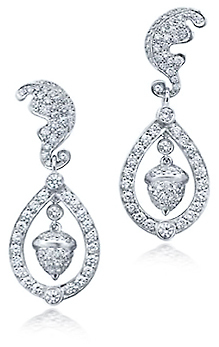 These gorgeous Kate Middleton Royal Wedding Cubic Zirconia Earrings Inspiration that are similar to the earrings she wore to her royal wedding are set with the world's finest quality cubic zirconia by Ziamond. 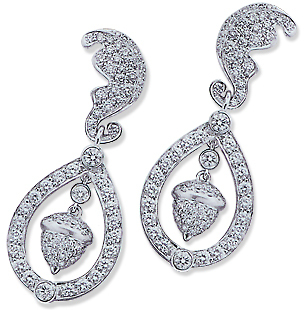 The drop earrings were commissioned by Kate Middleton's parents, Michael and Carole Middleton. 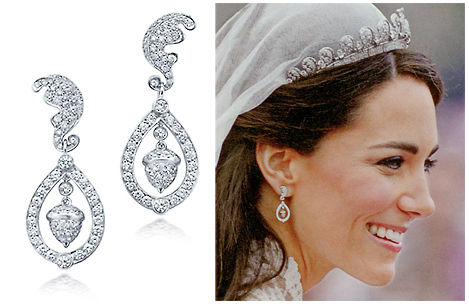 Kate's earrings were custom made and designed with special meaning and given to Kate as a wedding gift. The royal wedding earrings are pave and bezel set with oak leaf motif at the tops and with a pear shaped pave drop and a pave set acorn suspended in the center. The design for Kate Middleton's earrings stem from The Middleton family's new coat of arms which of course included acorns and oak leaves. 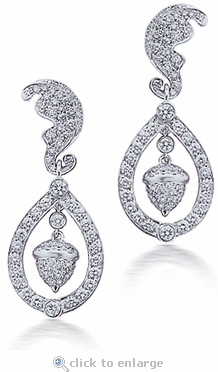 These royal styled earrings are a matched left and right pair with a length of about 1.25 inches and a total carat weight of approximately 3.5 carats. This style that was inspired by Kate's earrings are available in your choice of metals like 14k white gold, 14k yellow gold, 18k gold or platinum. Please see menu options or call 1-866-942-6663 for further assistance.